You will need to wash 2 big handfuls or 800g of whichever kind of asparagus you’re using, with their woody ends snipped off. This is a great combination. 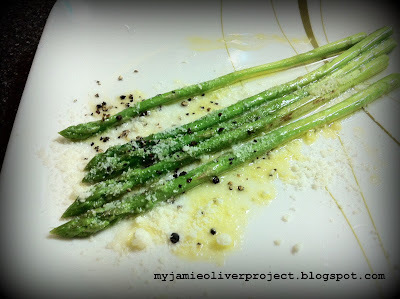 Parmesan, olive oil and lemon are wonderful with asparagus. Heat a large griddle pan and dry-griddle the asparagus spears on both sides until nicely marked. As soon as they're ready, put them on to four plates and dress with a good squeeze of lemon juice and three times as much olive oil. Season with sea salt and freshly ground black pepper to taste, then take a block of Parmesan to the table and either grate or shave some over the asparagus wtih a speed peeler. 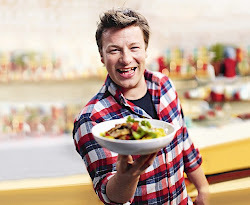 Simple method to prepare a vege dish. In the process of preparing this dish, I have learnt the trick of shaving my asparagus with a peeler if the stems are too thick. This makes the asparagus softer and silkier rather than the strong nutty hard texture. I did not follow the recommended ratio of lemon juice and olive oil as I didn’t want my asparagus to be too zesty nor oily. Hence, I just sprinkle an amount that suits to my taste. At the end of the day, I think that the black pepper and parmesan cheese did wonders!